My drinking companion and I had not been on a bar hop in Copenhagen for several months. Meanwhile new places was popping up all over the city and it was time for a new tour. 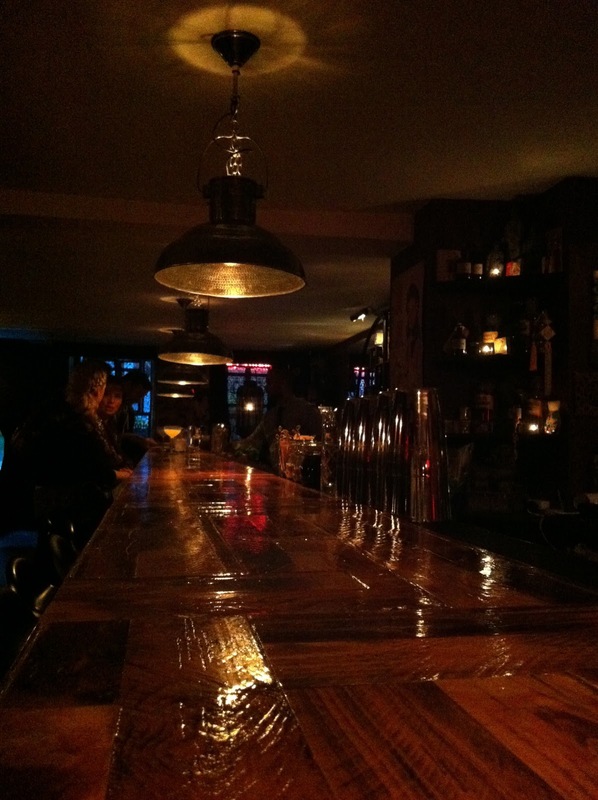 We visited three new bars, three basement bars in the oldest part of the city and had three really good experiences. First stop involved navigating down a few very steep steps at Gråbrødre Torv. The journey down was worth it, we were welcomes into an oasis of nice light, mellow jazz and the most amazing Art Deco wall paper found anywhere in the city. The attention to detail is evident in everything from the logo on the cocktail menu to delightful old photos on the loo at Strøm. Very cool and very tasteful. We navigated to the end of the bar, where we found almost an alcove offering us some much needed back rest and a perfect view of the bartenders at work and a huge chuck of the room. The cocktail menu was pure delight: Old favorites, new discoveries and three different cocktails on tap. We happily ordered the first round and started planning..
My first cocktail was Death in the Afternoon, my companion ordered a Cablegram. The fact that it's even possible to get a champagne cocktail in Copenhagen for less than 100 kr. is amazing in it self. The fact that it was made from the real stuff, and mixed with such dexterity, that it did not turn opaque from the absinthe was an extra bonus. Hemingway - who invented the cocktail - advices that you slowly drink three to five of his tasty creations. But I had more bars to visit and wasn't done exploring what Strøm had to offer. For the next round we both chose a Zeppelin, a whiskey cocktail with both egg white and local honey. It reminded me a bit of a Penicillin. Finally we got to taste cocktails on tap. We split a Dark and Stormy and a Punch - nice stuff but I'm not convinced that the aging actually makes a huge difference. I can see where the bar benefits especially with more complicated drinks than Dark and Stormy. Overall Strøm is a quality bar, a place I'll be happy to stop by on my may to dinner or after a lomg day at work. The attention to quality and the well being of the guests is noticeable. I'm a sucker for little things like fresh eucalyptus and offering a better champagne than the one on the cocktail menu because an open bottle us available. Our second bar was found next to Fugu at Gammel Strand. This time the steps led us into a luxurious harbor joint in Singapore in the 1930's. From the long gleaming bar, over the magnificent copper lamps to the displays lit by bordello red light in carefully constructed recesses in the wall: Madame Chu is all business. To the point where the choice of music played stands out like a sore thumb. It was modern, it was hipster cool and while not unpleasant in any way such a departure form the script that it must surely be an in the know joke. On that we did not get - but we are not the target audience. The cocktail menu is challenging. I did not recognize a single cocktail, but between the expressive names and the listing of ingredients, we managed to place an order. My first choice was Sabrina All Night Long (rum, maple, caramel and dill) and I was amply awarded with a gorgeous pale green drink finely balanced between the vulgar and the strident from the dill. My companion when for an Happy Ending (Bourbon, rhubarb, mint and absinthe) and was quite happy with her drink. Then she went for a Candy X (rum, ruby port and ginger) which turned out to be a very cheeky rumdrink the marriage of ginger and ruby was a succes. I happened upon perhaps the best cocktail of the day. Lost at Sea (gin, sea buckthorn, Aloe Vera and Thai basil). I had not previously had the buckthorn in a drink, it's a taste both sour and mineral at the same time and there is a reason it's such a star of the New Nordic kitchen, it's like a Nordic lemontaste. In this cocktail it was introduced in the form of sweetened jam and it was perfect. The fact that it also attributes a solid, warm sun yellow color is an added bonus. Our final drinks at Madame Chu was a No. 42 (vodka, Lillet Rose, tomato, rhubarb and lemon) and a Red or Dead (Gin, red bell pepper, lemon and sugar). I don't normally drink vodka cocktails, but I believe the rhubarb/tomato mixture would have been to busy with juniper from gin added. So, in summary Madame Chu challenges the visitor and get's away with it, but it's the kind of place where you had better enter with a shoulder first, the bar likes posing and expects the same from it's guests. Not that we got anything other than great service and left happy - and a little bit zigzaging up the basement stairs. Our final destination was in nearby Badstuestræde - smack in the really old part of town, an area that has always been full of bars and beer/aquavit halls. The first thing that distinguishes Ourselves Alone from the two other bars is that you can't just walk in. You ring a bell and are let in. Not that they necessarily want to sort people or turn certain types away, but so that each guest can have perfect service from the moment they arrive. Your coat is whisked away and you are offered a selection of comfy chairs and small sofas grouped around low tables. Furniture from the 20'ies and 30'ies in pale pastel blues and greens. We chose seats at the bar and got the best experience of the evening. From the moment we arrived until we left bartender Knut Randhem gave us pretty much his undivided attention. I'm sure his ears were ringing when we left from all our questions and our chatter. But that is what Ourselves Alone expect - there is no cocktail card, so every order is a result of a conversation and discussion with the bartender. Except for the very first tiny coctail you are served with you first glass of water, as you settle in, take in the atmosphere of the bar and let it's quiet well balanced style wash over you. We both started with gin classics re-engineered with bourbon. A Last Word and a 20th. Century. Especially Knuts version of the latter was spectacular: Bourbon, Amer Picon and brown Creme de Cacao. So good that he has named it Middle of the 20th. Century. Then we had a couple of cocktails with egg white: A Clover Club and a Bourbon Sour. My Clocer Club was the palest of delicate pink - since they don't smash or cook the raspberries for the juice but gently break the fresh berrys and let the liquid drain. Our night ended with a couple of Ramos Gin Fizzes - not that morning light was breaking but just because it's sort of tradition with us. Ourselves Alone is a place were everybody should end their evening, even if it starts out with a mediocre meal at a mediocre restaurant. Ourselves Alone will make all mal-contentment vanish and give your evening an peaceful ending. It's a bar on one hand deeply masculine and on the other hand equally feminine. Actually it's the kind of place you should keep your little secret for fear it ever changes.